Honorary Wings coach, Kyle Fast Wolf. Wings is also proud to name Kyle Fastwolf (Oglala Lakota) as honorary coach of this year’s team. 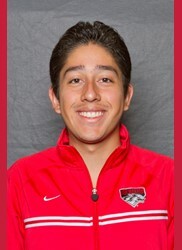 A former Wings National Team Member and University of New Mexico cross country and track athlete, Kyle has continued his commitment to running by coaching at his alma mater, La Cueva High School. Kyle will provide support for the Wings National Team trip in February as well as during the National Team training camp to be held in Albuquerque between Christmas and New Year’s. The Wings selection process relies on the dedication of student-athletes, coaches and parents beyond the regular cross country season. We would like to send a sincere thanks to all the families that rallied together to support their athletes into the winter. 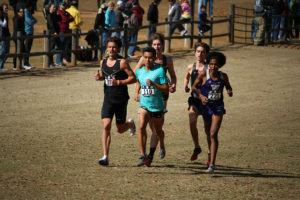 Because USA Cross Country Championship are not until February, our organization must know that prospective National Team members have what it takes to continue training and competing after the excitement of their state meet has worn off and their teammates have stopped training. We are immensely grateful for all the miles, time and money National Team hopefuls have devoted in recent weeks. Please be proud of your commitment. Since its inception, the Wings National Team has existed to encourage young Native runners to test their talents on a larger stage. We are happy to see that this goal is now being achieved perhaps more through the selection process than through the National Team itself. 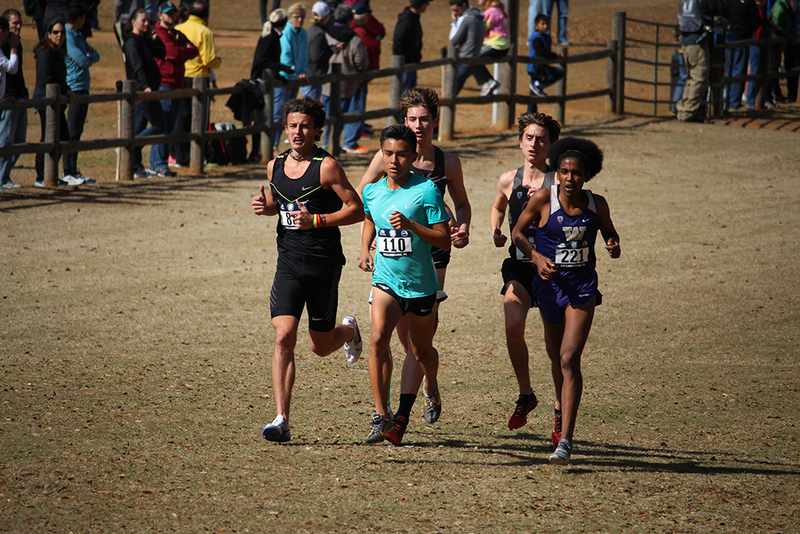 With nearly 50 runners posting qualifying times at Nike Cross and Footlocker Regionals, we are confident that the future of Native distance running is bright. Each year the “cut-off” time to make the National Team seems to get a little bit faster. If you are eligible in years to come, we sincerely hope you will try again. It is no easy feat to make the team and all that try out deserve praise for testing their limits. Transparency throughout the selection process is very important to Wings. By considering only qualifying race times as criteria for making the team, we believe we are setting the most fair and measurable standard for all National Team hopefuls. However, sometimes this can get a bit tricky when qualifiers run very similar times on different courses. In these cases, we rely on the input of experienced coaches, race directors, and the weather reports from race day to determine if one course is “faster” or “slower” than another. If you have any questions or concerns about why a time did not qualify you or your athlete for the National Team, please do not hesitate to contact Executive Director, Dustin Martin, with your inquiry (505) 977 5057. Wings was honored to provide dozens of Native youth race registration and travel assistance so they could attend their regional qualifying race to run for a spot on the team. Each year, student-athletes take advantage of this opportunity based on their regular-season cross country times (sub-17:05 for boys and sub-21:00 for girls) and their academic success (no D’s). Without a doubt, Wings provides the most support for runners in the southwest. From the Rio Grande Valley to Flagstaff, our staff picked up aspiring “rez runners” on their way to “the valley”. Please stay tuned to the Wings website to learn how you can take advantage of this assistance in the future. 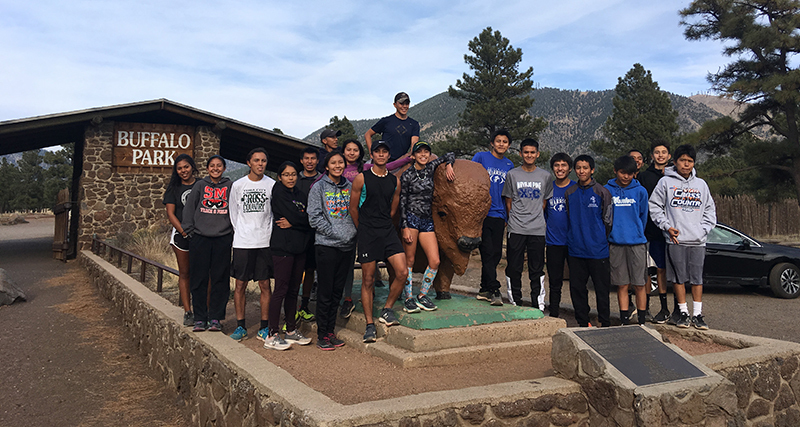 Runners pose for a picture on their travel break and pre-meet shakeout run at Buffalo Park in Flagstaff, AZ. Each of these young runners took advantage of Wings travel and race registration assistance to try-out for the Wings Team.